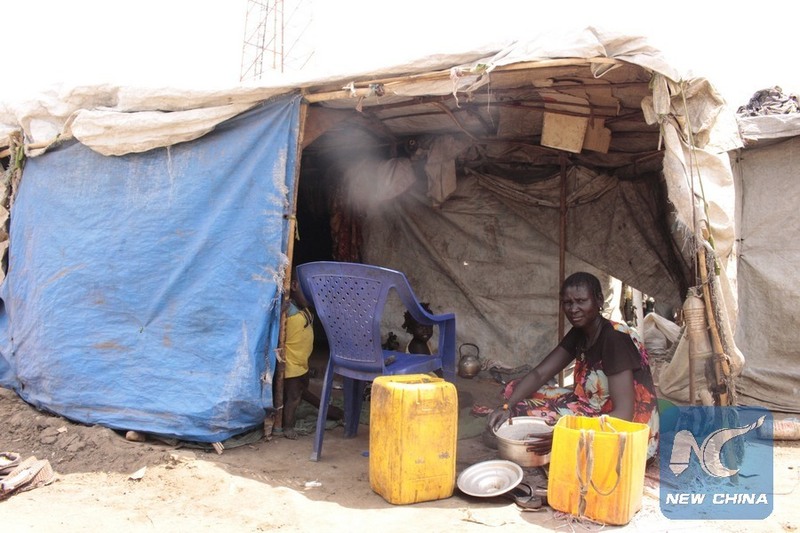 JUBA, April 16 (Xinhua) -- South Sudan's main rebel group, the Sudan People's Liberation Army-in opposition (SPLA-IO) led by the former First Vice President Riek Machar, said they have released the seven aid workers captured in March in the central region of Morobo. The seven aid workers were handed over to the UN Office for Humanitarian Affairs (UNOCHA) at the Ugandan border town of Koboko, deputy SPLA-IO spokesman Lam Paul Gabriel said in a statement on Sunday evening. "This morning (Sunday), the SPLA-IO command of Div. 2B and the administration of Yei River State safely released seven aid workers with three vehicles to a delegation of the UNOCHA along the Uganda border in Koboko," Gabriel said. "The handover was witnessed by the Ugandan police service." He said the aid workers were detained due to security issues concerning two of their colleagues who were discovered to be government security agents intentionally deployed to carry out hostile surveillance in the rebel controlled areas. Gabriel said the seven were released on directive of SPLA-IO leader Machar. "The SPLA-IO... calls on all humanitarian agencies to avoid being infiltrated by the regime so that they get easy access to SPLA-IO-controlled areas," Gabriel said. This came after UN Humanitarian Coordinator for South Sudan Alain Noudehou called for the immediate and unconditional release of the aid workers and strongly urged all parties to the conflict in South Sudan to ensure that the operating environment is conducive to the delivery of aid. A relief official working for the Catholic Organization for Relief and Development Aid (CORDAID) was recently killed along the Nhialdlu-Bentiu road in the northern Unity State. The SPLA-IO denied responsibility. About 90 aid workers have been killed and several captured by armed groups since outbreak of violence in December 2013, which hampers relief activities in the country with an estimated 7 million people in dire need of humanitarian aid. In March 2017 eight aid workers from the U.S.-based charity Samaritan's Purse were captured and held by the SPLA-IO at Mayendit, about 680 km northeast of the capital, Juba. They were later released. South Sudan descended into violence after political disputes between President Salva Kiir and his former deputy Machar led to a split, leaving soldiers to fight alongside ethnic lines. A 2015 peace agreement to end the conflict was weakened after the outbreak of renewed fighting in July 2016. The warring parties are expected to resume a third round of talks in the Ethiopian capital of Addis Ababa on April 26.